Developed by Frank Nichols in the late 1950s and built by a succession of companies until the late 1960s, the Elva Courier is far better known in the U.S. than in its home country of Great Britain, and remains a competitive and popular choice among vintage racers. Founded in 1955 by Nichols, Elva (taken from the French elle va – “she goes”) was focused on racing and built sports racers and Formula Juniors. The Courier was nominally a street car with rudimentary weather equipment, but its light weight and simplicity made it ideally suited to club racing. The story of the Elva is typical of British “cottage industry” racing. Nichols built a successful one-off and started a company to produce it. A greengrocer on England’s south coast, he became a car dealer and club racer whose kit for the popular 1172-cc Ford 100E engine raised enough money for a prototype sports racer. This was the Mark I, and Elva Engineering Co. Ltd. in Bexhill-on-Sea was set up to build it. Other cars soon followed, including the original Courier. The Courier Mark I featured fiberglass panels molded from the aluminum prototype set onto a ladder chassis with Standard 10 suspension and the modified Ford engine. Showing how fast Nichols’ ideas evolved, the Mark IB version switched to a wishbone front suspension and the Mark II incorporated a De Dion rear end in a space frame. A Mark IB did well in U.S. racing, and Walter Dickerson, owner of Continental Motors in Washington D.C. convinced Nichols to build a street-legal version. After opening a larger factory in Hastings to satisfy demand, the production version of the Courier was introduced in 1958. The fiberglass body gained headlamps, bumpers, a full windshield, rudimentary weather gear and a small trunk. 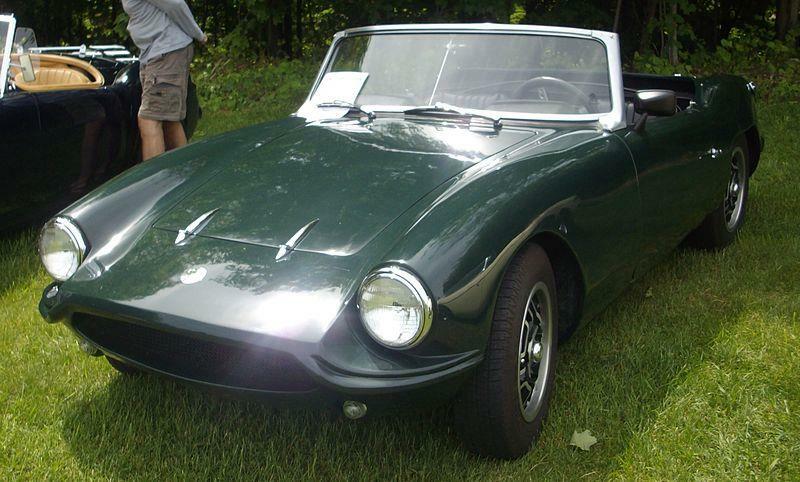 For simplicity, the Courier kept a ladder frame and utilized Triumph suspension parts and the 1498-cc engine from the MGA. Weighing almost 500 pounds less than the MGA, the Elva was significantly quicker. Both topped out at 98 mph, but the Elva could do 0-60 mph in about nine seconds, two seconds faster than the MGA. As the size of the engine in the MGA grew to 1600 cc and then 1622 cc, it did so in the Elva as well. Elva also sold a competition model with an 1100-cc Coventry Climax engine and 130 mph top speed. Archie Scott-Brown set records at Brands Hatch and won races in the U.S. in the car. By 1961 400 Couriers had been sold, almost all in the U.S., and Nichols had 75 employees. In the States, however, Dickerson couldn’t pay for the cars he had ordered, and ultimately went to jail. Nichols sold out to Trojan in South London, the company that had been building Heinkel bubble cars. Trojan refined the Courier and introduced the Mark III in 1962 with a redesigned chassis, offering both the roadster and two coupes, powered by MGA, MGB, or Ford 1500-cc engines. This was followed by the T-Type with fully-independent suspension, which was capable of over 100 mph. Trojan lost interest in Elva in 1965, and sold the T-Type to Ken Sheppard’s Customised Sports Cars, which produced 38 more cars and a handful of Couriers for export. Elva Racing Components Ltd. still exists in England, helping owners maintain their cars. Couriers can still be found at the front of small-bore production grids at vintage race meets.